browsers for status, configuration, diagnostics and print run configuration. With print heights from 10mm up to 65mm, the 400 series printers offer a solution to the most demanding requirements. The PostJet 400 series is easy to install, setup and maintain, and with fewer spare parts to manage reinforces PostJet as the lowest cost of ownership solution. The latest development from PostJet – the PostJet 400 series – combining a compact foot print with new built-in fully functional control electronics delivering high-speed high-resolution printing. 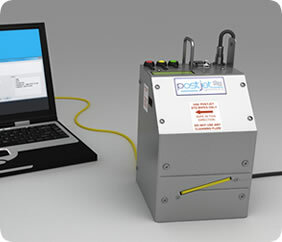 With its integrated controller and integral LCD display, the 400 series is the first PostJet printer to include full functionality in a single box, allowing easy retrofit in a variety of applications.